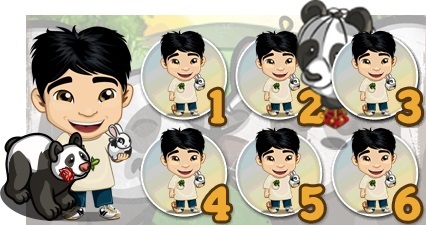 Help Hiro with his Panda in Jade Falls Chapter 4 Quests. The FarmVille find Panda romance in the island of Jade Falls will have six missions. Assist Hiro as he play as Dr. Love on gathering the materials and necessities to prep up his Panda for a date and create some magical situations that would ignite the burning fire of romance and light it up to the air. So for a start, it is a good thing if you already built a Jade Habitat. It will be used on this chapter and if you haven’t build one start collecting parts by either asking friends or clicking on friends FarmVille help feeds. There will also be a crafting tasks and 1 Animal Mastery. Keep upgrading your Mountain Palace. Note: This FarmVille Quests guide may change for this is currently unreleased. Expected roll out will be on Monday (June 25). Tip: Place and harvest the Panda Ewe in Jade Habitat or if the quest icon is showing in the other farm you can place it in Livestock Pen. Info: 1 day to grow and harvest (never withers). Info: Crafted in Tea Garden and needs the folowing bushels Jade Bamboo x3, Sichuan Pepper x3 and Jalapeno x3. Info: Crafted in a level 2 Tea Garden and needs the following bushels Jade Bamboo x3, Sticky Rice x1 and Basil x3. Info: Must be harvested 5 times to achieve 1 star Mastery. Info: Crafted in a level 2 Tea Garden and needs the following bushels Edamame x1, Azuki x3 and Wheat x3.